We support scientists in improving their communication and outreach. We offer workshops in communication skills at professional meetings and labs, and assistance in preparing accessible materials for non-scientists. Below you can find examples of some of the work we’ve done. This write-up of a March 2015 workshop conducted by Director Susan Hassol and Science Advisor Michael Mann at Virginia Tech, illustrates what a day-long Climate Communication workshop looks like, addressing framing, messaging, social media, public talks, and media training, and offering lots of opportunities for practice. In 2014, 2015, and 2016, Susan was an instructor at communications training events for several Regional Climate Science Centers around the country, including the Northwest Climate Science Center’s Climate Bootcamp and the South Central Climate Science Center’s Early Career Researcher Workshop. Susan also spoke at a workshop for Fellows of the Southeast Climate Science Center and led a media training sponsored by that Center for senior scientists from across the state of North Carolina. In addition to scientists, in 2015 Susan spoke on climate communication to public health professionals in St. Paul Minnesota for Ramsey County, and in 2016, she delivered a keynote address to transportation professionals in Denver for the Colorado Department of Transportation. She gave another keynote talk at UNC Chapel Hill’s Climate Change Symposium in which she addressed recent advancements in our understanding of the science of climate communication. In March 2013, Susan conducted a national webinar for the National Oceanic and Atmospheric Administration staff and affiliates, providing tools and tips about communicating climate change to the public. In February 2013, Susan went to Washington DC for Climate Science Day on Capitol Hill, where she addressed scientists on communicating climate change to their representatives. In December 2013, Susan, Science Director Richard Somerville, and photographer James Balog of Chasing Ice conducted a panel on communicating climate change at the fall Meeting of the American Geophysical Union (AGU). In May 2012, Susan traveled to Woods Hole to work with scientists at the Woods Hole Research Center, Marine Biological Lab, and Woods Hole Oceanographic Institute and gave a lecture, led a roundtable with communications staff, and led a workshop on communications. She also gave a talk at the University of Arizona in March 2012, as the plenary speaker for the U of A’s School of Earth and Environmental Sciences’ EarthWeek 2012. In April 2012, Susan, along with Aaron Huertas of the Union of Concerned Scientists, led a webinar on “Bridging the Gap in Public Understanding of Climate Change: What Can Scientists Do?” to an audience of several hundred scientists nation-wide. In January 2012, Susan spoke via videoconference to a NOAA workshop in Maryland focusing on science communication. The workshop was conducted by NOAA and the Chesapeake Bay National Estuarine Research Reserve. 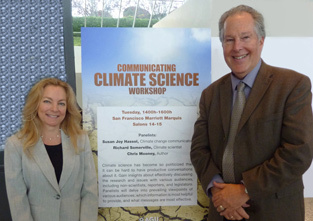 Susan and Richard have led several workshops on climate science communication at the annual meeting of AGU — one in December 2011, the other in 2010 (see photo above taken at the 2010 meeting). They also led workshops for the Climate Science Rapid Response Team. In November 2011, Susan gave an invited seminar at the National Center for Atmospheric Research on “Improving Scientists’ Communication of Climate Change” sponsored by Women Organizing Research and Leading Science. Susan and Richard led climate communication workshops at NASA Langley in November 2011, and at NASA’s Jet Propulsion Laboratory in March 2011. Susan and Richard both acted as mentors for early career PhD scientists during the week-long DISCCRS VI Seminar (Dissertations Initiative for the Advancement of Climate Change Research) in October 2011. Susan gave a talk at the 2009 AGU meeting called “Communicating With Congress (and Everyone Else)”. This visual mural was created during her talk by Julie Stuart of Making Ideas Visible. The mural was posted in the lobby of the Moscone Center throughout the AGU conference. If you are a scientist or an organization that would like assistance, please contact us.